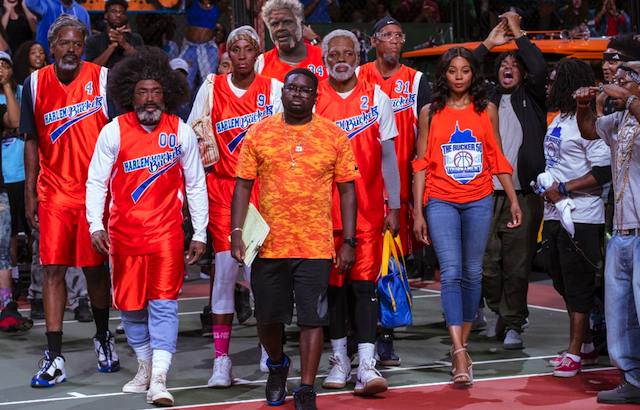 Yes, it is NBA/WNBA stars – Kyrie Irving (as Uncle Drew), Shaquille O’Neal, Chris Webber, Reggie Miller, Nate Robinson and Lisa Leslie – who go behind “old age” makeup to portray a rag-tag group of 1960s b-ball players who once dominated the “Rucker Classic”… a real playground tournament that still draws top players today. Lil Rel portrays an orphaned basketball addict who now coaches, but loses his team right at tourney time. In steps Uncle Drew to “get the band back together,” and that reunion is at the heart of this unusual and endearing film. In the following PART ONE podtalk with Patrick McDonald of HollywoodChicago.com, Lil Rel is all about “Uncle Drew,” relating how he was ready for his first lead role, and how his b-ball costars worked under all that old-age makeup. In PART TWO, Rel talks about “Get Out” and the impact it had on his life, and his early days in Chicago.